USB Mics, what are they for? Why would someone use one? These are both questions which have occurred to me in the past as I've never, until recently, used one. 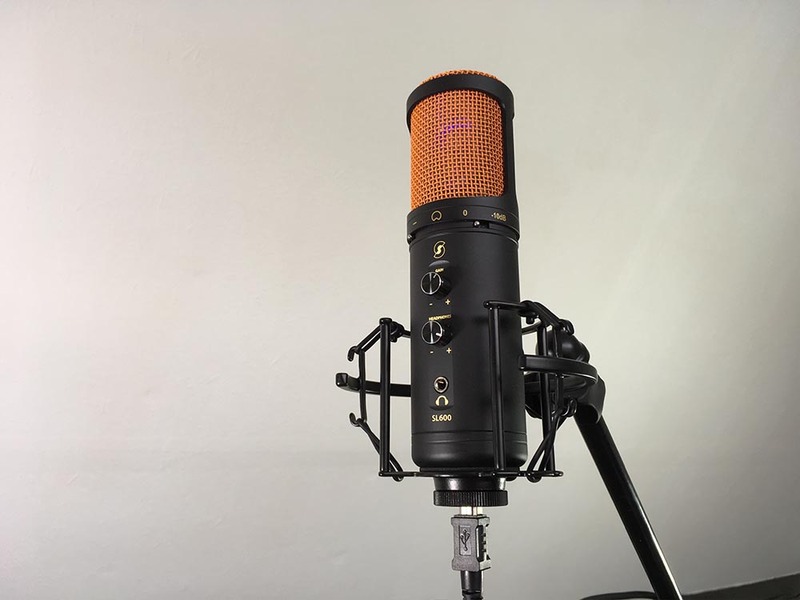 Our friends at Editor's Keys have been kind enough to lend me a couple of their SL series mics and my first question was, rather than why would I use one of these, can I use one of these with Pro Tools? The SL150 is the simplest and most affordable of the USB mics in this range and currently retails at £99.99. It is a fixed cardioid, large diaphragm USB condenser mic. Construction-wise the die-cast, nickel finish body of the mic has a conical taper to it and with its cylindrical head if you took a U87 body and attached a U47's head you would have something cosmetically similar to this (though, with all due respect to the SL150 this is where the similarity to either of these mics ends...). It has no controls on the body, just a USB B Type socket (the one you find on a printer) where the XLR would usually be. The 34mm gold diaphragm capsule is clearly visible behind the dual layer wire mesh and rather than having a power LED on the body, the capsule is up-lit by a blue LED so bright that it throws a small blue beam up to the ceiling. The USB lead supplies power to the capsule and being a USB mic supplies bus power to the built-in A/D converter. The A/D converter is a 44.1/48 KHz affair but is 16 bit only. Although it will happily record into a 24bit session, the 8 least significant bits remain unused restricting the available dynamic range. The SL600 is the most fully featured and most expensive in the Editors Keys range, though all of these mics are definitely at the affordable end of the market and currently retails at £189.99. After the conservative looks of the SL150 the SL600 is definitely a show off with a matte black cylindrical body and a bright orange grille! However gaudy that sounds, in the flesh it looks like a perfectly sensible piece of hardware. Attachment to the supplied shock mount is by a chunky thread surrounding the USB B socket and an identical blue LED shows the mic is powered up. This is also a fixed cardioid LDC. On the body, there are HPF and pad switches and a twin aluminium knobs, one for gain and the other for headphone volume. 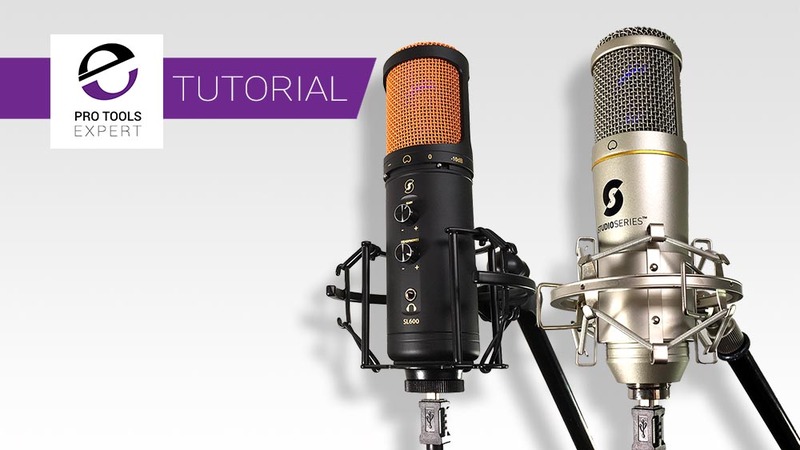 Here we get to the principal difference between the SL150 and the SL600 Whereas the SL150 is an input only device and shows up as an audio interface with no outputs, the SL600 is a 2 in 2 out device, effectively an audio interface built into a mic. The 2 inputs into the DAW can be disregarded, the mic is mono and the two outputs from the mic are just duplicates of each other but it is the integral headphone output which makes this interesting. The SL600 routes the microphone output direct to the headphones at zero latency and the ability to monitor your DAW through the mic might make this a convenient all in one tracking solution. Testing the output through Stillwell Audio's excellent Bitter reveals that although the supplied literature says the conversion is 16 bit, the output shows as floating 32 bit, suggesting a difference between the converters, having checked with Editor's Keys I'm told that the SL600 "features a 32-bit audio engine but records 16bit out of the box. This makes it compatible with more software (and situations.)". Both the SL150 and the 600 come in a rugged, plastic case with an elastic shock mount and a 3m USB lead. The shock mounts are specific to the mics, with the SL150 having a nickel shock mount which grips the conical body with a sprung steel sleeve, opened using two integral levers much like a bulldog clip. The SL600 has a black shock mount which I didn't rate as highly as the one supplied with the SL150 because rather than using the familiar fabric covered elastic loops, this uses what appears to be black O rings which are too rigid to isolate the mic properly making it more cosmetic than practical. Neither of these mics is without issues when used with Pro Tools, though these issues are easily overcome. The case of the SL150 is simple in that it is an input only device and because Pro Tools, unlike many other DAWs doesn't allow the user to specify a different audio device for input and output respectively this mic is awkward in use. In the images below the problem can be clearly seen. Studio One (I could just have easily used Logic, Reaper or even Audacity as an example here) has separate control over which of the available audio devices on your system is used for input and output, meaning that is it possible to use the SL150 as an input device for recording and to use an attached audio interface for monitoring and playback. So if you want to use the SL150 with Pro Tools it will be as an input only device (unless you aggregate with another device - more on that later), or you are happy to capture your audio using other software - I love Pro Tools but I often use other software to capture my audio, for all sorts of reasons, or if you are capturing audio which doesn't need to be monitored. The lack of a gain control puzzled me at first but by using the Input Volume control in Sound Preferences it is possible to attenuate the input to your DAW. Of course, there is no facility to raise the gain but the default is well chosen for typical vocal or voiceover use. The SL600, being an input/output capable device (what we called Duplex in the old days...) is a more interesting proposition. I can see a use for it in situations where I want an easily transportable system capable of capturing good quality audio with simultaneous low latency monitoring - i.e. to replace a typical low-cost USB interface, though of course without line inputs or stereo recording. The issue for use with Pro Tools is that the mic input and the headphone output present themselves as separate audio devices and as such they can't be used simultaneously with Pro Tools. This is similar to how the built-in audio input and output on a Mac present themselves to Pro Tools and the same solution is called for. Using the Audio Midi Setup Utility in OS X it is possible to create an aggregate device of more than one of the available audio devices on your Mac. In the same way, as by default Pro Tools creates an aggregate device combining the built-in input and built-in output into one device for Pro Tools you can easily combine the input and output elements on the SL600 into one device. This is also a potential solution for anyone wishing to use the SL150 as part of a larger system though because there is no hardware monitoring available as there is in the case of the SL600, latency might be an issue in such a setup. It might have occurred to you that I haven't commented on how these mics sound. Well in short they put in the kind of far-too-good-for-the-money performance we've come to take for granted from inexpensive condenser mics. These sound like the budget large diaphragm condensers that they are, and I don't mean that as a criticism. There are some minor differences but these will be investigated in a shootout where the plan is that they are going to be joined by some other USB mics from other manufacturers. Stay tuned.